On this glorious Memorial Day holiday weekend, as most of us stop to pay our respects to more than one million fallen men and women who served our country proudly in many wars in far away places and made the ultimate sacrifice, I also pause to remember a dear neighbor who passed away last Thursday afternoon. Barbara June Stanfield has been our neighbor ever since we moved to our current home almost 37 years ago. She and her husband, Wayne, have been the best neighbors you could wish for over all these years. We met them the first time on the very first day we were in our new home. I had a clogged shower and interrupted them as they were about to embark on a Model "A" ride to borrow a ladder so I could try to unplug it. Three hours later Wayne - a plumber by trade - had unplugged the drain and launched a great friendship between our families. Barbara was born in Banning on August 18, 1928 and attended public schools in that community. An outstanding student, she graduates high school at age 16 and briefly attended the University of Redlands. She met her future husband as a child and they were sweethearts since age 13. They married on May 4th, 1947, recently celebrating their 63rd year of marital bliss. As I looked through old photos for her family it was almost impossible to find one of her alone. Practically all of them were of her with Wayne, which is not surprising, since they've done EVERYTHING together throughout their married life. Barbara was a devout Christian who led her life by example, demonstrating to all around her a life of faith, patience, persistence, loyalty and love. Throughout her lifetime she was known as a fun and loving woman, with a quick wit, a luminous smile and a spirit that made you feel welcome, whether a family member, neighbor, friend or simply a stranger. With the skilled eye for detail, scale and perspective of a person with an early desire to be an architect and a tireless work ethic, Barbara created a beautiful home for her family and guided friends and neighbors with their own interior design and landscaping challenges. Always ready for a new adventure, Barbara loved outings with Wayne, their family and extended family of friends and neighbors - including my wife and myself. She and Wayne traversed the Colorado River through the Grand Canyon in a wooden dory; explored Lake Powell during the time it was filling for the first time; discovered far away adventures in their motor home and loved touring the desert back-country in their dune buggy with a gaggle of friends in tow. For more than half-century she helped operate the family business, Stanfield Plumbing Company, in Costa Mesa. Her husband and their son did the plumbing and she did the books. Upon their retirement Barbara and Wayne spend much of their time at their vacation home at Lake Havasu, Arizona, where they enjoyed a quiet, yet full life helping neighbors and turning their little getaway home into a showplace. In recent years they returned full time to their home in Costa Mesa, where temperate climate and the embrace of their family awaited. 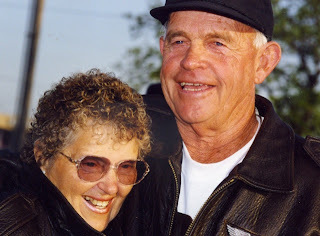 In addition to her devoted husband, Wayne, Barbara is survived by their son, Wayne Kent Stanfield (Theresa) of Santa Ana, daughter Cathy Binnquist (Bruce) of Costa Mesa, four grandchildren and eight great grandchildren. We will miss our friend, who welcomed us into their family and provided us with much joy and wise counsel over the years. We will miss the twinkle in her eye and her example of a life well-lived. Barbara passed away at age 81 at Hoag Hospital Thursday afternoon after a short stay. A celebration of her life will be held at the family home in Costa Mesa on June 2nd. Private inurnment services will be held in Banning at a future date. Barbara and Wayne were patients of mine for several years. She was always so fun to have in the office. Wayne adhored her. This is such a bummer, but I know she is rejoicing in heaven with her Lord and Savior. Thanks... I'm sure you are correct. So sad. It's a blessing to have had a neighbor like that. Thanks, Claudia. Barbara was a very, very special person in our lives. She will is missed.